When buying a property it is important to have input from someone with experience in such matters and there is no one better qualified than a financial advisor to help you through the minefield of mortgages, loans, debentures and other such terminology used in the home buying process. A financial advisor is an individual - usually affiliated to the Financial Services Authority (FSA) who can offer you impartial advice on how best to go about applying for and securing a mortgage. Financial advisors also offer advice on insurances, investment strategies and how best to manage your money. An independent financial advisor is someone who carries out exactly the same tasks as we have already mentioned but does so without any affiliation to any one mortgage lender or insurance company. Many advisors work with a handful of companies with whom they have built up a rapport over the years and although this can be helpful it does not necessarily ensure that you get the best deal. An Independent Financial Advisor will help you make an informed choice from all the information, quotations and offers he or she has received by canvassing a great many lenders and providers on your behalf. When you first start looking for a mortgage it may seem as though you are being blinded by terminology and financial mumbo-jumbo. 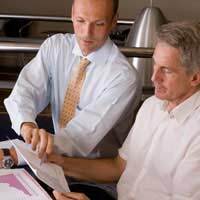 This is where the services of a financial advisor can prove invaluable. Everyday there are hundreds of advertisements on television, in local press and on the Internet offering cut price mortgages and re-mortgages but it is easy to become dismayed and confused by the number of so-called 'products' available to the borrower. A financial advisor will be able to sift through the products on offer and find the best deal for you depending on your own circumstances and how much money you feel you might reasonably need to borrow. Your financial advisor will help you put together what is known as a 'package': this is essentially your application for a mortgage and will include not only details about you - and possibly your partner - but also financial information such as salary, other incomes, outgoings, etc. In essence this application is a potted history of your financial status and includes details of any adverse credit you may have. Your financial advisor will assist you in finding the right mortgage based on the information you have provided them with and they may be able to negotiate a better deal then that which you had originally hoped for. Again your financial advisor may be able to help with providing a solicitor to act on your behalf if you do not have one of your own. They may also be able to help you sort out buildings and contents insurance which are necessary insurances that all mortgage companies require before agreeing a mortgage. You can opt to go for insurance offered to you by the mortgage company or you can source your own - which your financial advisor will be happy to help you do. For more information on financial advisors you should visit the Financial Services Authority's website at www.fsa.gov.uk or use your local Yellow Pages to find a financial advisor in your area. Most financial advisors offer a free consultation or reduced fee consultation in order to try and establish your needs.